There is no authentic source to cite where Gulab jamun originated from. In a recent poll conducted on Twitter, The Government of Pakistan’s official account asked “What is the national sweet of Pakistan?” giving the options between gulab jamun, jalebi and barfi. The evergreen delicacy, gulab jamun, emerged victorious with 47% of the votes while jalebi earned 34% and barfi landed with 19% of votes. Given the stringent options in the poll, many people tweeted their unhappiness and rejected the result. The news came as a sweet one for the fans of the dessert who immediately took to Twitter to tweet their approval. A resident, Ahmad Afzalh tweeted, “At last someone else thinks like me” while another Twitterati from Pakistan, EyeOnPak wrote, “I love gulab jamun” and _LostMarauder added in approval, “I can’t have it any other way. 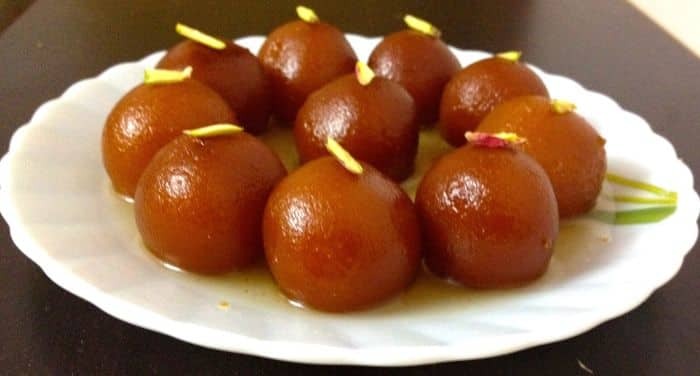 Gulab jamun!” However, a quirky banter spilled on the micro-blogging site after the news as some felt that the famous Karachi Halwa or Sheer Khurma or Lab-e-Shireen should have been included, others were left dissatisfied since the dessert, gulab jamun, is not originally from Pakistan. Some demanded a repoll and this time want it to be conducted across other social media platforms like Instagram and Facebook as well. Various other questions broke the Internet ever since the poll results broke out. Around 15,000 people reportedly voted in the poll, with jalebi trailing gulab jamun. The deep fried dough balls or dumplings that are called gulab jamun are essentially made of milk powder, flour, butter and cream or milk and then soaked in sugar syrup. They are called the life of every party and no desi celebration is complete unless this dessert is present – be it a wedding, at a festival, at a party or any other celebrations. It is said that Central Asian Turkic invaders brought the sweet dish to India. However, there is no authentic source to cite where Gulab jamun originated from.